Magazine Inspiration Pic for one of my kitchens in the 1990’s. Once upon a time (back in the 1900’s, before some of you were born), I fell in love with a kitchen in a magazine photo (the photo I tore out from a magazine is above, I wish I knew what magazine it was from!)). That photo became my inspiration for a paint, tile and curtain makeover of my kitchen at the time — that was about 17 years ago. Even back in the 90’s, I wanted to paint that desk, I still remember not liking it! As a side note, you can see in that old photo above that I had the same antique stained glass WAY BACK THEN (on the other side of that same kitchen with the blue and white curtains!) After that they were in my living room. Much of what I have in my home has been in my homes for years and years — I really do use and reuse what I have. So how can one can furnish their home on a budget and be able to use, reinvent and reuse the same things for 20 years? That is a question for another post — I’ve got lots of tips for you on that subject. I’ve had three other houses since that kitchen with my favorite curtains, and each time I moved, of course I brought the remainder of my beloved fabric with me, fully intending to use it again. I never fell out of love. I don’t keep everything (that would require a few storage rooms or a couple of extra houses! ), but my classic favorites seem to follow me forever! But, for one reason or another, I just didn’t get around to using that fabric again in another house. Until now. Several months ago (as you might have seen on Facebook! ), I sent that fabric home with my mom and asked her pretty please to make me some new curtains for my dining room (she had also made those kitchen curtains so many years ago)! I had hung some black and tan curtains in my dining room over the winter, and while they were nice (also recycled from a previous home! ), they really didn’t add to the fun quirky style I had imagined for this space, especially in the summer months. I was ready to punch things up a bit. So with June arriving, I was excited to brighten this room up with this fun and lively blast from my past (which incidentally, I seem to see similar patterns like this EVERYWHERE now!} What was old is new and the amazing thing is…it is still chic and lovely, even after 17 years! Because the fabric was not long enough, we simply added a band of blue fabric which not only made the curtains the right length but also gave it a finishing detail! Want to see how it keeps evolving? They look gorgeous, Larysa! What a difference they make to the room. Thank you for your always-inspiring posts. Big hugs to you this week. Aw, that is so sweet, thank you! I’d LOVE to come to South Africa!!! That would be amazing!! The blue looks wonderful! I love to make a change that results in going into that room several times a day just to “look”!!! Amazing! That really freshens up the room, and it just goes to show that you have timeless taste…a great thing to have in our constantly changing redecorating world! Your new curtains fit in perfect. I love your windows! Too bad you can´t get that kind of glass here in europe. Costs a fortune here! When I first saw your photograph I instantly thought of Miss Mustard Seed’s living room and other images I am seeing on the internet and in magazines. After reading your post, I realize it is YOU that inspires others to always remain true to who you are, to decorate with what appeals to you. Your curtains look stunning. Hi Larysa. With Ikat fabric so en vouge now, your style is years ahead of its time. Love the curtains and especially the fact that they are reused! Love your posts! I’m continually redecorating our 1890’s Victorian,and it’s so much fun to see what everyone else is doing. I’m only now starting to post some pictures (wish I’d started sharing the journey earlier, but I’m a late bloomer with technology). Love your curtains! It’s fun to see how things that inspire us years ago still have a special place in our hearts. am off to milk the goats! Wow Larysa, what a world of a difference that print and color make in that room overall! I LOVE it! Wow, the fact that you picked such a beautiful and timeless print from your first home, and are able to re-use it today is so awesome. I love all the color in that room. Love,love, love the curtains. I, too, am a dedicated “re-purposer”. My current porch curtains started out as kitchen curtains and a sway in the dining room and my landing lace valance was formerly in an upper bathroom that had shutters below. Keep inspiring us to go for what we love! Great taste never dies, you were born to decorate! Do you still have the desk?? I’ve learned to reuse too, we’ve moved so many times, it’s too expensive not too! Looking forward to many more repurposing ideas from you! The curtains are lovely, Larysa! I also like the pleated cover on the chair, too! Wow, what a difference! I love that print, and you’re right, variations of that are everywhere. 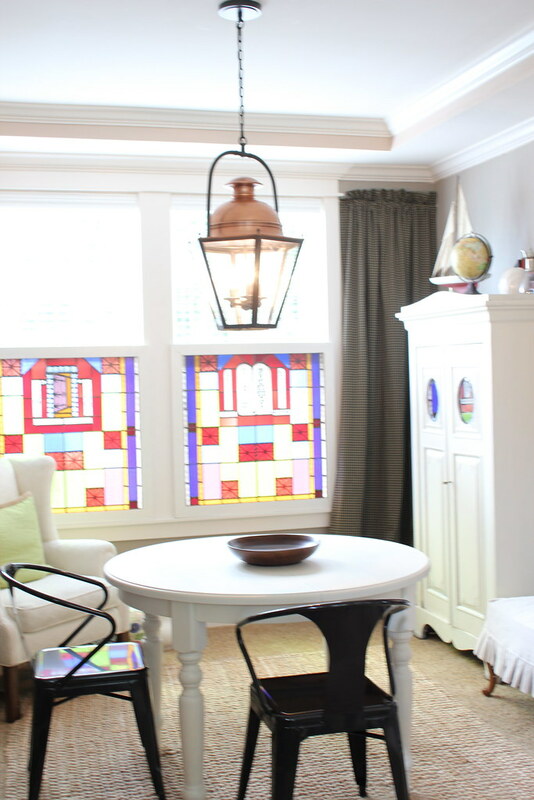 I’m in the process of deciding what to do with the windows in my dining room. Thanks for the inspiration. i love looking at all your transformations. however, i do wish i knew how you had time to do it. baby boy at 15 months doesn’t give me but about 2 hours at nap time, and that is of course, when i look at my blogs. Well, being that my mom made the curtains I can’t take credit for the time those took. And this room has been just evolving over time, I just am trying to be patient with the process! :-) That slow process of evolution is the only way to go if you are busy or on a budget like so many of us are! I like it A LOT A LOT A LOT! The room is so refreshing and inspiring! Fresh breath of air! WTG! Love the curtains! I have seen that style everywhere lately! I guess you just know how to pick a classic style when you see one, good job!!! Very fresh! I guess 17 years is the trend cycle? I was at a fabric store yesterday and I saw something very similar. And I *love* how your kitchen turned out. It’s better than the inspiration picture! Gotta be thankful your mom sews for you. Very nice curtains! I like the wide band of solid fabric at the bottom to add the length. I agree about the fabric, when you love it, you love it! :-D That goes for many things we decorate our homes with. One of the many “gifts” I was given by my mom and other teachers, was learning how to sew. That’s saved me hundreds of dollars over the years. These are fabulous!! I love that your sweet momma made new curtains for you, AND that they’re still lovely. I can’t believe what a difference they make, they really pull the room all together. It looks magazine worthy! I so understand…been doing the re-use redo since 1980…yup I’m old. Have you noticed how the stained glass is reflected in the chairs around the table? I love that and the curtains, such color and sparkle. Looking forward to more ideas about re-using what we have. My home was built in the 80’s so even if I ditched all the furniture so many of my beloved decorating items are in the gray-blue color scheme I’ve had all this time. Yes, I noticed that reflection too…that is one of those happy unexpected things that I love, a subtle detail that enhances the beauty of a space!! Thanks for noticing! Those curtains really bring out the room. I liked it being brite then the curtains seemed to make the room pop. Thanks for being so creative and sharing. Wow, vintage fabric at its best, LOVE that pattern!!! Way to go, Larysa! The curtains look absolutely gorgeous in your dining room. Three cheers for your mom–how kind of her to sew for you, both 17 years ago and now. By the way, I’m probably the 100th person to tell you this, but I LOVE those stained glass windows. What treasures. It’s such fun to see how you’re making this house reflective of you and your fun style! Your mother is so talented! They really do perk up the room and look great beside the vibrant stained glass windows. I’m so glad that you mentioned not looking at the “swine” strip up there. This is the first time I believe that I can see what you’ve been talking about all along. The current color is ever so much nicer and the swine is a lot too pink. Those curtains look perfect! I love how they look in your room! Now I want some funky blue and white curtains! But it’s been less than a year since I made my current curtains, so I’ll have to live with them for a while longer. I love your new curtains! They really brighten up the room, and you are SO ahead of the curve with that pattern :) I love to hear you’ve been saving the fabric for years. Thank you for sharing! great post! the curtains are FANTASTIC. But those windows. wow. take my breath away!!!! They look great in your room Larysa! So bright and fun! Gorgeous, Larysa. Love the color, so pretty. When we did all our moving (over 30x for army and 2nd career) who knew we were repurposing. It is just waht we all did! I had 98×84 basic beige drapes, other curtains of various sizes an Hong Kong Oriental rug plus carpet remnants I had bound. We put the furniture where it fit which often took a lot of repurposing! It was a great life! Such a simple change . . . and so lovely. you are so right, I am forever tweaking and revamping seasonal stuff like velvets and cottons. I am redoing a bathroom right now simply with new curtains, a skirt and some paint, no gutting here. Stay tuned. I am so glad you help onto that fabric! The window looks amazing. I can’t believe that’s old fabric–it looks so fresh and new! Love how it brightens up the room. Why doesn’t any of my decorating from the 1990s look this current? There’s no way I could reuse any of my fabrics from that decade. Ha. Your curtains are amazing – I’ve looked at your “before” and “after” at least 5 times now. The new curtains bring so much life to the room. Great job! Decorating like renovations seems to be a neverending job. Even if you don’t follow the trends, your tastes change. It’s always evolving. Love the blue. They look gorgeous! Wow! Love the pattern and the color! It really brightens up your kitchen! Love it! It’s so neat how styles really do cycle through. Looks great! I like saving money, I just haven’t thought to take the old and make it new. I always go to the store for new stuff. but here I see we can utilize the old, and make it new! Thanks! Beautiful! It’s so true, that what we’re drawn to and fall in love with, our classics, seem to follow us. My gut always draws me to blue. I recently made very similar patterned Ikat curtains for my living room and can’t wait to hang them up. I too, was inspired by a photo in a magazine (BH&G) and had to track the fabric down. Isn’t surrounding yourself with what you love, so gratifying? Thanks for another great post. Larysa, you are so right about certain pieces/patterns/styles being classic and never out of style. I’ve been seeing similar patterns everywhere, too. I love that you stay true to what you love. Those blue curtains are awesome…such a wonderful punch of color and they bring so much energy to the space. I love ’em! Beautiful room! I love your space and a lil change is great! I still have curtain fabric in my closet. I have some blue and white gingham, and some back and shite striped fabric. The blue and white I will use in my kitchen someday, and the black and white will make fun seat covers on the back patio. I love a good fabric stash!! How did you do the ten commandments? I LOVE that! please tell me about your black chairs. i really want some petite chairs for my dining table and those look perfect! Where did you get the fabric for the curtains at? Love them!! Larysa, I wish I had your talent. I found I do my best work by using my corel paint program. I start by building the bones of the rooms and playing with paint themes before I even start painting. Then I go around the house and dig up things that work with the theme to see what I have that works. When I buy new curtains, I always buy 4 pair of curtains even though most of my rooms only have three windows. This way I can swap them around from room to room. I’ve been busy painting and have completed two rooms and am now working on a “French Country” blue kitchen. Thanks for the inspiration. Those curtains add so much! I love that you have had the fabric for so long. I have also been known to buy fabric without knowing exactly where I will use it… I am always glad I did though! Love love love the room. Where did you get the fabric for the blue Ikat drapery? I need that exact fabric if possible.